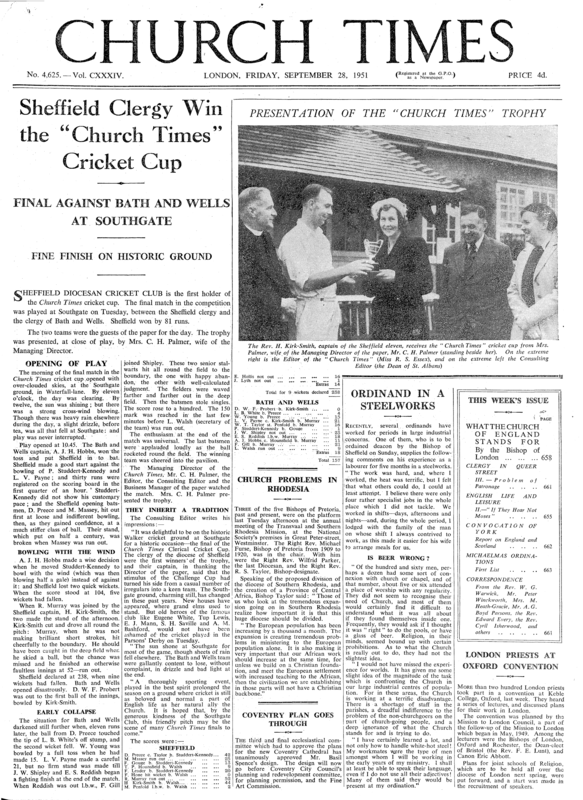 The Church Times Cricket Cup began in 1951 and has been fiercely contested by dioceses ever since. Nevertheless, 18 teams, from English and Welsh dioceses, entered the first competition in 1951, and, in 1952, six more joined in, and the competition was divided into four regional leagues. Rules stipulated that teams were to consist of men in holy orders who held a bishop’s license; laymen were permitted to umpire. Today, each team is allowed up to four non-clerical players who either hold a bishop’s license or who are full-time church workers in the diocese (non-Anglican players included): the remainder must be persons (men or women) in holy orders who hold their bishop’s license or have permission to officiate. First-round matches are played in four regional groups: North; Midlands; South-East; South-West. Ten points are awarded for a win, five points for a draw. The winners and runners-up of each group go through to the quarter-finals, where they battle it out for a place in the semi-finals, and, ultimately the final. The final is played on the first Thursday of September at the Walker Cricket Ground in Southgate, north London – where it has been played every year since 1951.